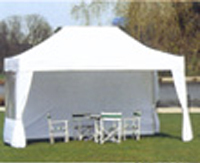 The premier pop-up range is a modular designed marquee that is easy to use and has great integral strength.The premier pop up marquee can be erected within a minute by two people (3m x 3m size). 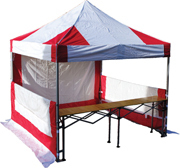 It can be also converted to a temporary office or shop with the addition of ready made accessories, such as corner shelves, interior counters, windowed side sheets and trim curtains. 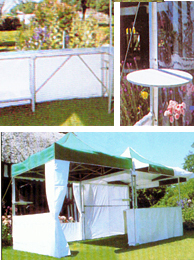 You can also link more than one premier pop up marquee together by use of leg connectors and rain gutters.